Spain is a country in Southern Europe. It is in the Iberian Peninsula. 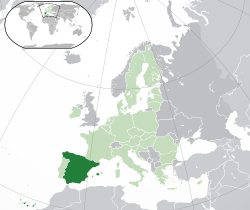 Spain is bordered by France, Portugal and Andorra. In Spain's northeast side are the Pyrenees mountains. Since 1975, Spain has had a constitutional monarchy. The King of Spain is Felipe VI; he only does what the constitution allows him to. The parliament is called "Las Cortes Generals," and has two bodies: "El Congress" (The Congress) and "El Senado" (The Senate) and it is chosen by the Spanish people by voting. The Prime minister is Pedro Sánchez. The government and the king's palace are in Madrid, the capital of Spain. Spain has more than five hundred thousand square kilometres of land. It is smaller than France, but it is bigger than Germany. Almost fifty million people live in Spain. 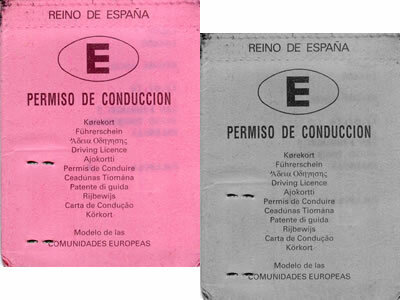 Spain is divided into 17 autonomous communities (this means that they can decide upon some affairs themselves). Each community has its own government. The Kingdom of León, the most important in the early Spanish Middle Ages, was started in 910. This Kingdom developed the first democratic parliament (Cortes de Llión) in Europe in 1188. After 1301, León had the same King as the Kingdom of Castile in personal union. The various kingdoms remained independent territories until 1833, when Spain was divided into regions and provinces. In 1492, the Christians took the last part of Spain that still belonged to the Moors, Granada. Boabdil, the last Moorish King of Granada, surrendered to King Ferdinand II of Aragon and Isabella I of Castile on 2 January 1492. Ferdinand and Isabella then ruled all of Spain.